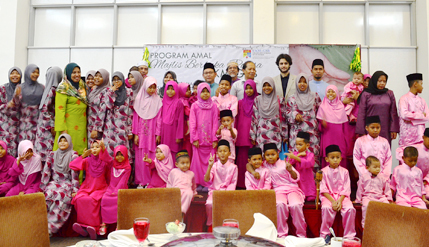 BANGI 21 July 2014 – The National University of Malaysia Graduate School of Business (UKM-GSB) brought the joy of Hari Raya Aidilfitri early to orphans from two orphanages in Kajang and Ceras at a breaking of fast at Puri Pujangga at its campus here today. Some 84 children aged between 6 to 17 from the Pusat Penjagaan Persatuan Kebajikan Islam Peribadi Mulia, Kajang and the Rumah Anak Yatim Jalinan Kasih were also given ‘Duit Raya’ and goodie bags from GSB. A GSB PhD student Rafidah Othman who is passionate about charity work having organised a number of other charity events suggested GSB organise the breaking of fast for the orphans. She had earlier gone to the Peribadi Mulia home in Kajang with other GSB students and faculty members and had managed to rise over RM30, 000. Speaking of her charity work, Rafidah felt she had been blessed by Allah to help those facing hardships so that they too can experience the joys of life. The event was made possible with donations from organisations and individuals as well from GSB. Among the major contributors were Best Choice Real Estate Development Sdn Bhd, MD Solution, Usaha Kekal and Iltizam Catering. Dean of GSB, Assoc Prof Dr Izani Bin Ibrahim praised his students for collecting donations and organising the charity event as part of their responsibility to give back to society. Ustaz Abu Dardaa Bin Mohamad from Department of Dakwah and Leadership from the Faculty of Islamic Studies (FPI) gave a short talk (tazkirah) on “Thankfulness” before the breaking of fast dinner. Chairman of the charity project, Assoc Prof Dr Puan Binti Yatim and GSB Deputy Dean Assoc Prof Dr Khairul Anuar Bin Mohd Ali were among those attending.